It Was A Swift Rise To The Top For St. Vincent This Week. Debate the following sweeping statement all you like, but the truth is that Taylor Swift is one of the most powerful artists in the music industry at the moment. But she's a benevolent dictator: By bringing out all kinds of heavyweight talent to make cameo appearances during her current tour, she's been spreading her fame around to other deserving artists. At one of her shows this week, it was Grammy winners St. Vincent and Beck who came out and accompanied Swift on a song. Of course, those two are no slouches in their own regard. 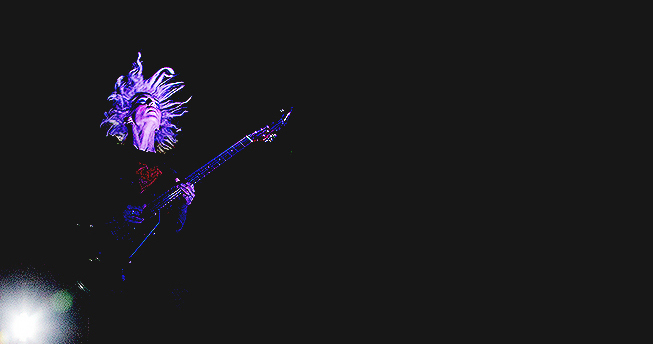 To further drive that point home, St. Vincent also got her own signature guitar from Ernie Ball this week. And, hey, let's not forget: With this week's No. 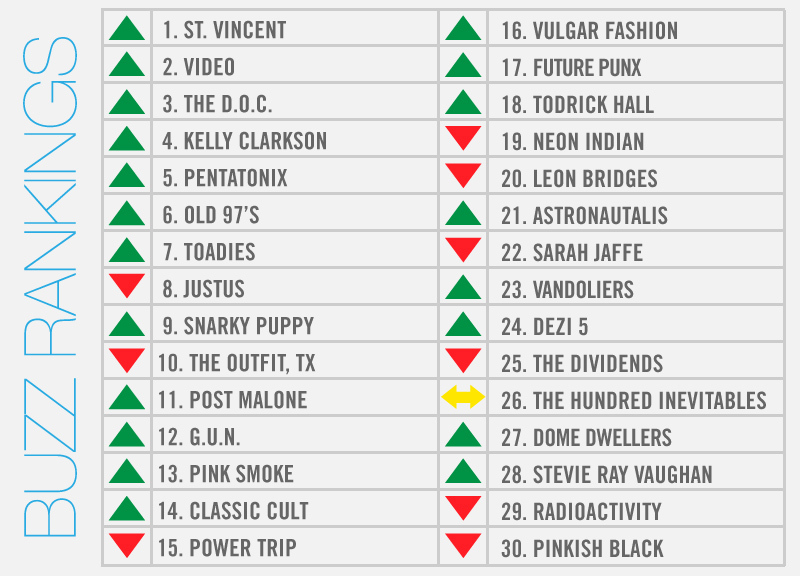 1, she's now topped our weekly, local music power rankings six times. Just behind her in this week's rankings is VIDEO, which just landed a deal to release its upcoming record via Jack White's Third Man Records. That announce initially came via Spin, which also premiered the first cut from the Toadies' new record this week. Speaking of new records: Pink Smoke released its sophomore record last week, and Vandoliers and Dome Dwellers will follow suit this weekend. A bit farther down the road, The D.O.C. might join that group, too, as he recently regained his famously lost voice. Other buzzing acts earned their spots this week based on high-profile shows: Kelly Clarkson and Pentatonix will perform at Gexa; Old 97's played Lone Star Beer's free festival; Power Trip blew the lid of Trees at this month's Sound Select show; Sarah Jaffe will appear at this weekend's KXT-presented Summer Cut festival; Snarky Puppy played with David Crosby at the Granada; Astronautalis is playing Oaktopia's pre-party this weekend; and Classic Cult performs its first-ever show at Dada this evening. Elsewhere: Todrick Hall's new MTV show premieres this Monday; Post Malone dropped by two of the nation's biggest hip-hop radio talk shows this week; and Vulgar Fashion's getting the old band back together.